A pre-ride was completed on June 1-2 under difficult (hot & humid) conditions. Fortunately the cue sheet is in good shape in terms of directions. The weather highlighted the need to identify a few contingencies. Good news is that Kimballs Road descending toward the Lackawaxen River bridge has finally been repaved. 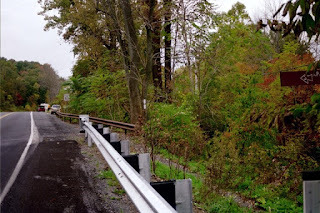 Not so good news is that Towpath Road (the other side of the bridge down to Lackawaxen) has not, but at least the major potholes have been filled in. Not really news at all is that Old Mine Road remains in the same poor condition as always. Controls are generally well-spaced, but trying to cover two legs on a pair of water bottles could leave you wanting for something to drink. Monitor you water bottle fluid levels and take advantage of the numerous "non-control" facilities along the way, including, but not limited to those noted as additional cues on the cue-sheet. Check your food and fluids at each controle and keep you tank topped off. If you have the capability, it would be wise to carry additional stores as the hour grows late. It is also advised to buddy-up for the night riding if possible. There is safety in numbers. Not everyone will have empty bottles at the same time (hopefully), and extra eyes on the road are useful for navigating and locating poor road conditions. There are more than a few locations with wheel-eating potholes. 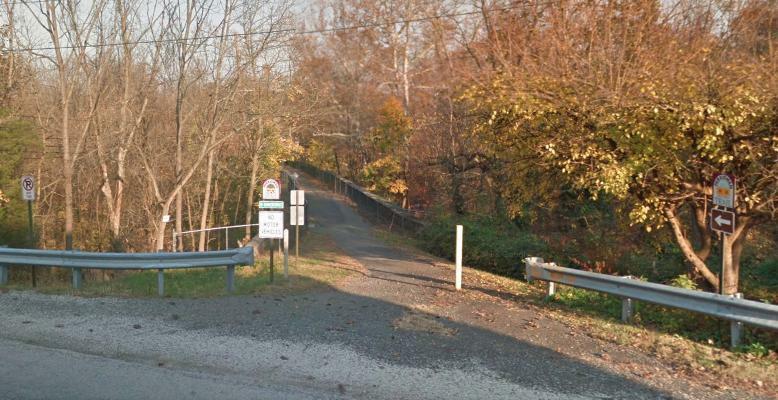 Some riders may be arriving at Controle 7 (Delaware Water Gap) later in the day. The Apple Pie Cafe officially closes at 8pm, though it may be open longer on the weekend with an outdoor barbecue going. Alternatives include Doughboy's Pizza (also on Broad St) and a couple of convenience stores past the Apple Pie Cafe along Broad St. In a pinch, The Deer Head Inn located along Rt 611 near where the road comes up from the river crossing should be available at most any hour. In the event you arrive after the cafe closes, treat Water Gap as an open controle. There are also 24-hour services in Columbia, NJ just across the river from Portland. While these are off course, they are known to be open at any hour. Simply cross the pedestrian bridge at Portland, turn left on Decatur St at the other side of the river, and follow the road across the interstate. You should see all of your options there. We plan to have volunteers on course Saturday to monitor your progress. It is sometimes magical how you arrive at a secret controle just after you drink the last little bit of water in your bottle. While you shouldn't plan on this, you should be aware that you're not totally alone in the middle of nowhere. The second loop out toward Lancaster County includes the ever-popular postcard controle at the Limerick Post Office. Tradition requires that you provide a snappy Limerick on your postcard to entertain the RBA during results tabulations. 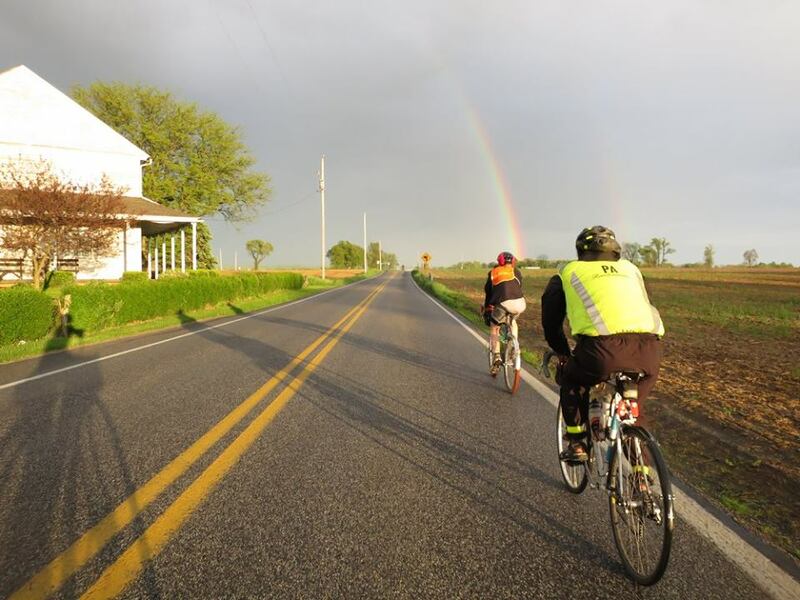 You will find a few examples in the 2014 600k Ride Report if you need inspiration. The 600k riders have all day Saturday to work on theirs, so expectations are high (TIP: write them down early. You may not be able to remember much more than your name on Sunday morning.) The 200k riders have less time but should be mentally sharp having only covered 25 miles before reaching the Post Office. Give the beautiful green foliage on the hedges along the road on your right from Limerick down to the Skuylkill (600k miles 281-282, 200k miles 27-28) a WIDE berth!!! The hedges have no leaves of their own and "Those shiney green leaves of three" are poison ivy. The Sunday turn-around controle is located in Blue Ball, PA and is located in a convenience store that is more of a gas station. Depending on your arrival time, it may be the ONLY location that can sign your brevet card. Carini's Italian restaurant is across the intersection from the controle, but doesn't open until 11am. Otherwise, Morgantown offers a good selection, including a Dunkin Donuts, Sheetz, Turkey Hill and several joints. Remember that you will pass only those establishments west of the Rt 10 intersection in town on your return trip so if you have a hankerin' for some Dunkin Donuts coffee, stop on the outbound leg. - Summer weather has arrived with a vengeance. Be mindful of your fluid and electrolyte levels and it might also be a good idea to carry an ice sock with you if you need to cool down. - Roads remain in poor condition in many locations after the winter. You should be extra vigilant for potholes and rough road surfaces. - Helmets are mandatory. Riding without a helmet will result in an immediate disqualification. - SPOT trackers will be handed out to selected riders. If you are given one, they have a feature to call for help if you need it and are out of cell phone range -- if you are unfamiliar with how to use this feature, a volunteer will be happy to explain it to you. If you have a personal unit not already listed on the PA Randonnerus SPOT Tracking webpage: http://www.parando.org/SPOT_Links.html please send me a link to your SPOT webpage. - Take advantage of non-controle stores, many of which are noted on the cue sheet. - If you are still riding past the ride time limit or if you intend to abandon the ride, please contact me on my cell phone: (610) 417-7161 It is your responsibility to make arrangements for alternate transportation. - Be sure to carry identification along with your emergency contact information in case you are knocked unconscious. If you are very tired when you reach the finish, it may be a good idea to take a nap before a long drive home, so you don't end up with serious injuries. Dorm rooms are available at the hostel finish, and we'll find a spot for you whether you have made a reservation or not. The Eastern Pennsylvania SR series wraps up with the 600k on June 4. Event details have been posted on the website at http://parando.org/PA600K.html. The cue sheet is also posted. We return to earlier variations of the opening day which include Promised Land State Park, Hawk's Nest, Port Jervis, and a return through the DWGNRA on the New Jersey side before returning to the overnight controle at the hostel. The second day includes a generally out and back loop to Lancaster which shares some of its routing through the French Creek area with the recent 400k return. It should be a great route. A pre-ride is scheduled and updates will be posted. Organizers Bill Olsen, Guy Harris, and Chris Nadovich will once again be on hand to take care of you. Breakfast items available at 1 hour prior to the start on Saturday and as usual, there will be post-ride food available. The route returns to the Weisel Hostel (stat/finish) at approximately the 400k point where our volunteers will be ready to feed you dinner on Saturday. Showers are available (bring your own towel) and sleeping accommodations for Saturday night are included in the entry fee. While linens are provided, you might want to bring your favorite pillow, earplugs or a sleeping mask to make the most of the overnight. Since your car will be close by, a drop bag is highly recommended. When you awake on Sunday, breakfast will again be offered at 4am so you are well fueled for the final 200k. A post-ride meal awaits your return to allow sharing of tall tales and anything else. You will have access to the showers (maybe you want to bring two towels) and the dormitory should you want to take a nap before heading home. Pre-registration is required for both rides. Use the Pre-Registration Form. You can also make arrangements to spend Friday and/or Sunday night at the hostel should you wish. Please make those selections when you register. It's $25 for the first additional night; $40 if you choose to stay Friday AND Sunday nights. Finally, a reminder about registration fees. The registration fee is $75 ($25 for 200k) for riders who are PA Randonneurs members AND have a current RUSA membership. The fee is $80 ($30 for 200k) for guests or those without a current RUSA membership. Please take a moment to double check the hostel reservations and course option I have listed for you. There are some randonneurs that say the 400k is the most difficult of the brevets since it is the longest distance that has to be completed without the benefit of an overnight sleep stop. Since it's appearance in 2010, The Blue Mountain 400k has proven to be one of the more challenging of the 400ks. Organizers Bill Olsen & Guy Harris along with "master starter" Chris Nadovich once again pulled off a fantastic brevet. Seventeen riders clipped in for a 4am start from the hostel and headed out into the damp darkness for a full day of brevet adventure. By sunrise the weather was improving and provided a few hours of sunshine. And wind. As the day progressed, a pair of fronts passed through each with a line of rain squalls. By evening, the rains had passed and most riders were benefiting from a tailwind assist toward Quakertown. Sixteen riders finished the 400k course within the time limit while all three 200k starters finished. Keeping the riders company were volunteers Gil Lebron and Doug Haluza. Gil pre-rode the route earlier in the week, helped out at the start, and then spent time out on the course encouraging everyone as a revitalment control. Doug spent most of the day Saturday keeping tabs on the riders as a sweeping observer. You can find Doug's photo album from the day at https://flic.kr/s/aHskAicF8x. Pat Gaffney, rode the 200k route, handled food prep for his fellow 200k riders, and then set out to watch over the 400k riders in the final miles of the course. Seeing these friendly faces out on a tough course often provides that extra little bit of motivation to keep tired riders pedaling onward. Thanks to these volunteers for adding that extra bit that makes PA brevets so successful. Three strong riders, Bill Fischer, Gavin Biebuyck, and Geoff Brunner, managed to claim first finisher spots. Writes Gavin: "Great ride. The route tweaks made the ride very different from my first 400k six years ago on this same general route. Much quieter and yet relentless rollers! Panther Valley gets my vote for best new road. I also was surprised to view Route 23 to Morgantown from the clouds on a northern ridge I have only ever viewed from below - quiet pretty reroute that avoids the busy main road - thanks Andrew! Leisurely stops at Lickdale and the BK in Morgantown during rain squalls kept us drier than expected. Ended up with some sunburn. Thanks to great volunteer effort!" We also note that Geoff Brunner, while notching his first RUSA 400k finish, is no stranger to the distance. Geoff will be starting his third RAAM next month. We wish him well. Geoff writes: "...Just wanted to share a note of thanks directed to those who made yesterday a good experience for me. I finished my first 400k, and I was fortunate to have two strong riders and even better guys assist me through the last fifty miles of the course. Bill led the perfect navigation and Gavin came up "big" allowing me to use his spare headlight when my feeble excuse for a nighttime vision device wasn't going to "cut it" during the wet, winding descents in the dark throughout this stretch. I was concerned about the last 30 miles when Limerick turned into a bit of a ghost town at 9:30pm, but they helped pull me through. Chris, Gil, and Doug were great in their support of the event and Bill's friendly energy after we arrived made the satisfaction of finishing that much more enjoyable (never has lasagna tasted so good!). Lastly, thanks to you for your efforts in creating this great day of riding with good people on mostly peaceful roads with mostly courteous drivers sharing their space with us. Hope to be a part of future endeavors with the PA Randonneurs. ..."
CJ Arayata, James Hadad and Nick Manta also notched their first 400k finishes. I don't have much else to say, still physically and mentally recovering.... but that was the hardest ride I have ever done up to this point. Just wanted to link some pictures. James adds: This weekends' 400k was one of my favorite rides ever. The cue sheet was perfect. The roads were fantastic. I had a great time and loved every minute of the ride! Please pass on my thanks to the other volunteers, Chris, Bill, Guy, Bob and Gil (and anyone I may have inadvertently skipped). It was particularly great seeing Gil sitting on his tail gate with jugs of water in Bowmanstown. It was noted during the pre-ride checkout that the closing miles were almost devoid of any support facilities at the hour in which most riders would be passing. A last-minute cue sheet change involved adding notes for two off-course oases in the final miles near Linfield. Volunteer Pat Gaffney stationed himself near there to direct tired randonneurs to off-course food in Linfield lest their reading skills at the late hour fail them. At least one randonneur's ride was saved through the restorative power of a little food, rest, and time off the bike. "Thanks for such an incredible day yesterday. The route took me thru areas I have never visited by car, much less by bike. The approaching storms and what they would be like and where would we be when they hit added a bit of drama. I had to stop, escorted from mile 196 by Greg Keenan and Callista Phillips, at the diner near mile 225, which saved my ride. There's quite frankly not many other options! The diner set me back on track with oatmeal, water and a booth to sleep in for two hours. It was somewhat slow going at 3am but it's done and I am quite pleased. Thanks to the volunteers for all their hard work and hospitality, at the hostel and at the controls." His experience proves the old randonneuring advice that when you think you can't go any further, get off the bike for a bit, relax, eat a bit, and then start again refreshed. Many-a-brevet has been saved using these sage words. Safety is always a big concern for us, especially as distances increase and we know riders will be tired. Please mention any safety hazard you might have spotted or near-miss incident your saw. Your feedback will help us to improve things for next time. Cue sheet warnings and countless re-routes to avoid problems help but cannot fully eliminate the risk. One rider found a large pothole along Neiffer Road in the closing miles and took a spill. Fortunately the rider seems OK, but it reminds us all to stay alert and don't be afraid to take a few minute power nap to restore your perception if necessary. Long time PA Randonneur Rick Carpenter returned for one of his periodic visits and enjoyed the 200k route. He and George Brandt had a great time judging from the pictures by Rick. You can register on line at: http://parando.org/RegistrationForm.html Registrations closes at 5PM on the Thursday before the event. A pre-ride course checkout was completed yesterday by volunteers Bill Olsen, Chris Nadovich and Gil Lebron. An updated cuesheet has been posted to the website. You will want to make sure you have the Draft 3A cuesheet as there is a minor re-route near the Lickdale controle to avoid a small quarry that was dumped on the roadway of the original route. At mile 143, we still get on the Appalachian Trail, but heading south instead of north. 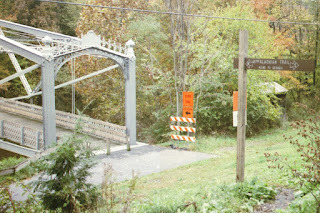 At the end of the pavement approaching the steel bridge over the Swatera Creek, turn sharply right and will walk your bike up a small pathway to SR 72 and then turn left on 72 and head down to the Lickdale controle. Do NOT cross the creek! Technically, we will be taking the Appalachian Trail south for about 100 feet, up a small grade toward the highway and away from the Swatera Creek. Space is tight, so exercise EXTREME caution when you reach the top of the path BEFORE venturing onto the roadway. One other noteworthy discovery: Services between Morgantown and Quakertown are non-existent after 11pm. There is a 24-hour McDonalds in Morgantown just after the control that features padded seating that makes for a decent rando-nap. This has been noted on the updated cue sheet. We have also noted some 24-hour food services in the Linfield area, around mile 221.6 on the cue sheet. There is a Wawa about 0.4 miles off course to the right along Ridge Pike. The always enjoyable Limerick Diner is another quarter mile beyond the Wawa. 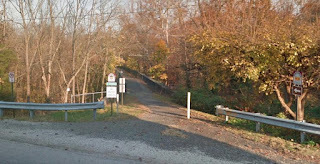 Since most riders will be making this turn in the dark, the photo above shows the entrance to the Perkiomen Trail at mile 230.1. Exercise caution since your headlight will be the ONLY light around. Finally, in light of the time most riders will be riding there is no charge for those wanting to grab a few winks in the hostel dorm Saturday night/Sunday morning. You safety is our number one concern and we want to assure that you're rested before getting in the car to drive home after the ride. A pre-ride is planned for May 11 so watch this space for any updates and details. A 200k option is also planned using the Lackawana course. The 400k riders will start at 4:00am. The 200k riders will start at 5:00am, still nearly an hour before sunrise so remember to bring your lights and reflective gear. Organizers Bill Olsen, Guy Harris, and Chris Nadovich will once again be on hand to take care of you. Chris will have breakfast items available 1 hour before the start, and as usual, there will be post-ride food available. Please take a moment to double check the hostel reservations and course option I have listed for you. Starting 2 hours before dawn, a mostly overcast day greeted the riders as they traveled through Bethlehem during the early daylight hours. 22 of the 24 300k and all 7 200k starters made it to the finish in good time. Two of the unofficial 300k finishers decided to follow the 200k course back to the hostel once they reached Water Gap. Congratulations to all, and well done for that good result. Of note, official RAAM finisher Geoff Brunner once again has clipped-in with us as he prepares for RAAM 2016. Joe R writes: "...Thanks for a scenic and challenging day yesterday! This was my first water gap 300k but I had done the 200k version last year so parts of the route were familiar while the stretch north of water gap were only partly familiar because of car trips many years ago. We enjoyed such pretty terrain up Old Mine Road and along Walpack Valley. I was especially pleased when The climb on the return to Water Gap that I had built up mentally into this monstrous thing proved to be quite do-able. Looking forward to the 400k!. ..."
Newd S writes: "...Thanks to you and all the volunteers who worked the event. It was a great course, well managed, planned and laid out. The scenery was beautiful and wildlife plentiful. A small herd of deer crossed right in front of me. The last deer was a little skittish about jumping the berm at the road edge and ended up running alongside of me for about 50 yards before it decided to beat a hasty retreat. The rough road conditions at the end of the ride took its toll. My rear derailleur took a hit and would not hold the chain on any of the cassette sprockets except the hardest. Had to manually hold the shift lever to get any incremental gearing. Challenges make the ride interesting ..."
Ed B. writes: "...Thank you Tom, Andrew, Chris, Guy, and Bill for Saturday's 300K Water Gap brevet. I really enjoy this route and liked the improvised out and back section up to Hainesville. The hot out of the oven apple cider donuts at the Water Gap were off the hook. I have finally learned how to ride that sneaky challenging last section back off the river to the Hostel. I enjoyed the Brevet. Thank you very much...."
First finisher Bill F. writes: "...Tom and Andrew - As always thanks for a wonderful brevet Saturday. For some reason I decided to go off the front at a ridiculously fast clip and paid dearly for my exuberance while crawling up Gallows Hill at the end. I have to give a BIG thumbs up to the new Apple Pie Cafe control - the service was fast, friendly and the omelette was excellent!...." Special thanks to a superb crew of volunteers who made this event possible: Chris N, for the Friday night setup and checking in riders in the evening and for cooking breakfast, checking in riders, and getting everyone on their way; and Bill O and Guy H. for preparing the postride meal, and manning the finish. This crew also performed the preride course checkout, and suggested the out-and-back course change.